As some of you would know, I'm currently in the process of coordinating a Layla group order for Aussies. Because of the number of girls who wanted some Layla polishes, I had to split the order into three separate orders so as to avoid paying customs duty. 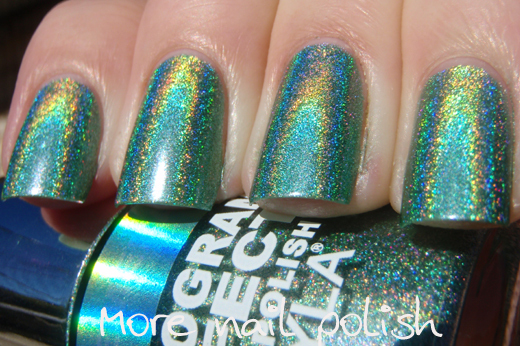 Naturally I ordered the holo polishes I wanted in the first order which arrived last week (and the FedEx tracking says the second order is in Sydney already). Ladies in the third order, I'll email you your totals soon. 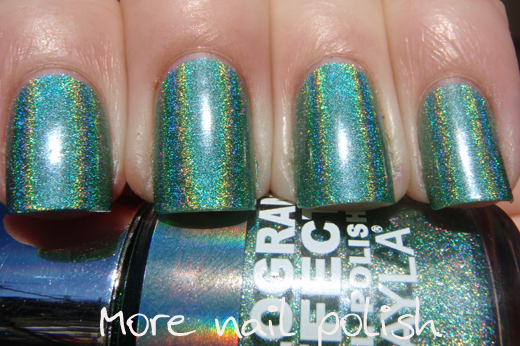 But in the mean time, check out part 3 of my Layla Hologram Effect polishes. All of these swatches are two coats with no base coat and no top coat. I did do a light nail buff to gloss up my nails as recommended by Layla. 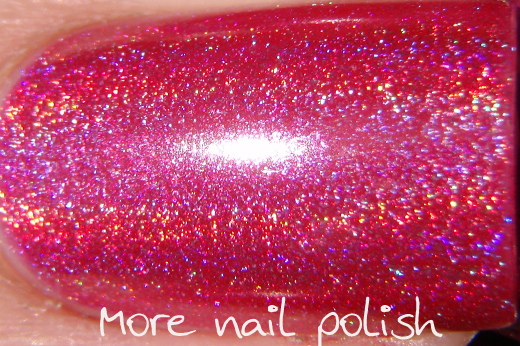 It's best to use a non quick dry top coat, as a quick dry top coat will dull the effect slightly. Gold Idol - this one really is a lime yellow. Calling it gold is a bit of a stretch for me. 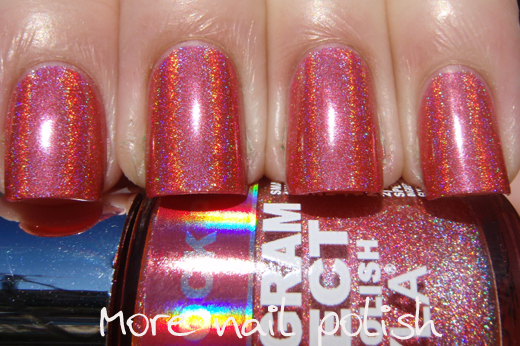 I've done a comparison of this against China Glaze L8R G8R and their colour is pretty similar. I will post comparisons soon. Emerald Divine - this one is a mid toned green with a very similar colour to Nubar Reclaim. Comparison swatch coming soon. Again, calling this on emerald is a bit of a stretch. For me, emerald is much darker and a richer colour. Still this is a stunning green and has good pigmentation. 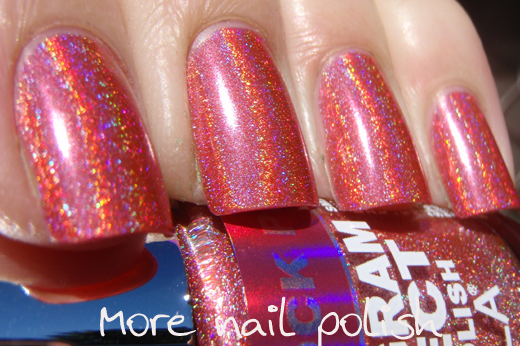 Shock Pink - is an orange toned coral pink holo. Again, not a completely unique colour (yes, yes comparison swatch coming soon), as it is very similar in colour to China Glaze TMI. Red Taboo - Come on, red? Nope this is definitely not red. 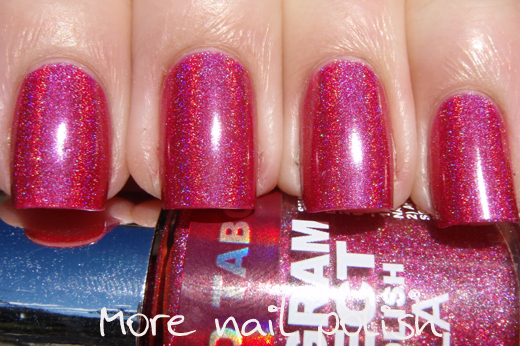 Ever tried adding spectraflair to a rick dark red polish and end up with a sure pretty dark pink holo? Yep me too. That's what this colour reminds me of. Strong and vibrant and gorgeous, but certainly not red. 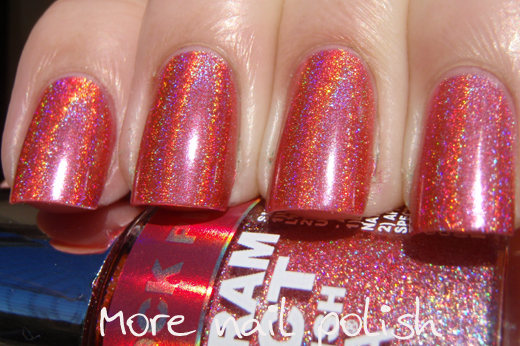 But interestingly, I didn't find a dupe for this one amongst my rather extensive holo stash. 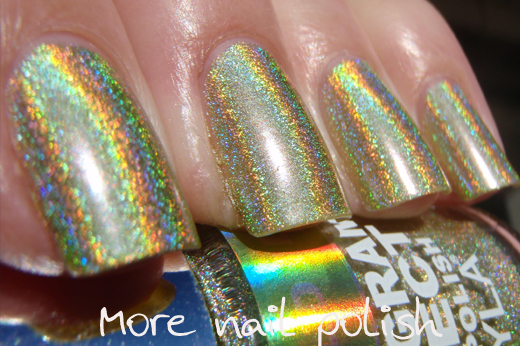 I wonder how similar it is to OPI DS Exclusive? 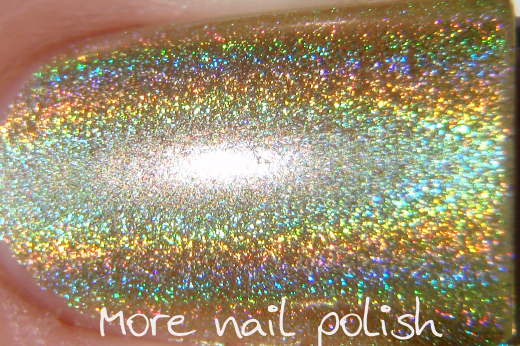 Part 4 tomorrow and then some comparison swatches against other holos. Mmmm, can't wait to get my hands on these! I am loving Emerald Divine and Red Taboo. 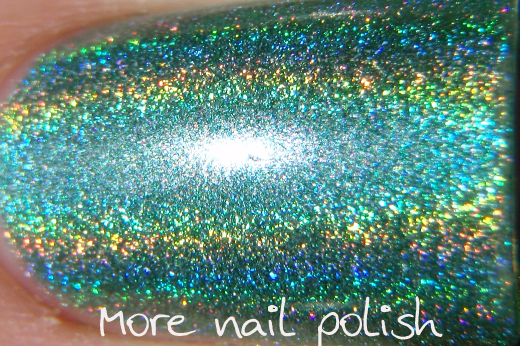 I actually prefer the colors they are, as opposed to the color names, since I loooove teal and wanted a teal holo, and also wanted a hot pink holo. 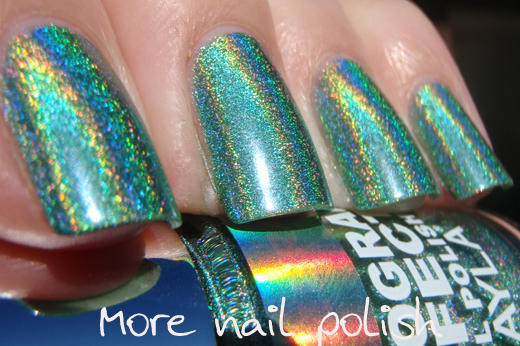 :) Though dark green and true red holos would be awesome as well. Thanks for the great pics! Red Taboo is not at all close to Exclusive, BTW...Exclusive is much more purple. 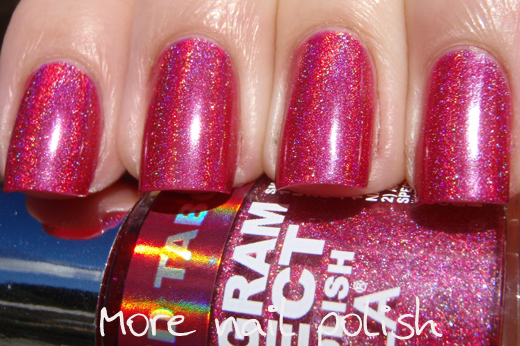 The base color is similar to China Glaze's Cowgirl Up. They all are amazing, but the Red Taboo ... I think I'm in love with him! They're all perfect! 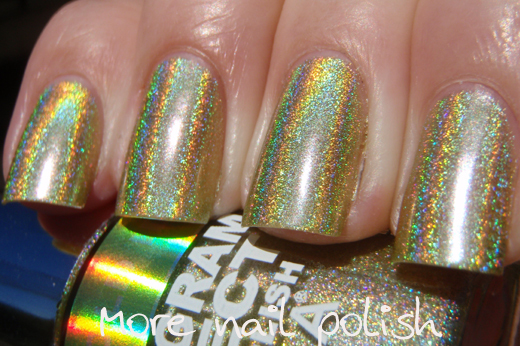 I love holos!! 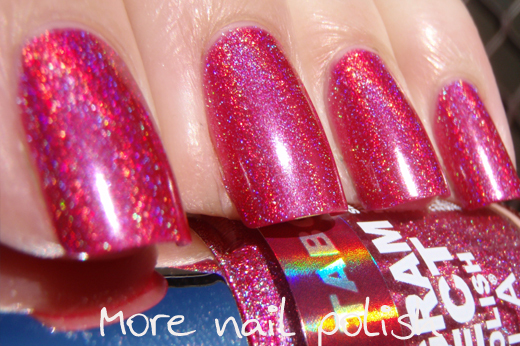 To me Red Taboo looks very similar to OPI DS Divine, it's a bright raspberry pink with strong holo, and one of my all-time favourites! 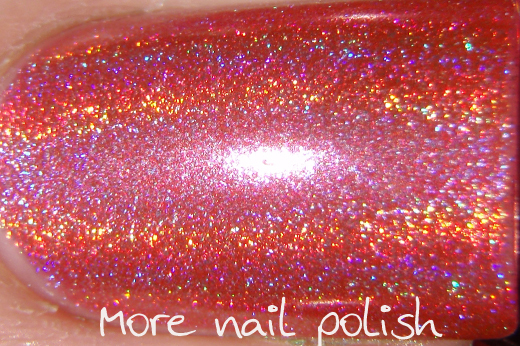 The only real red holo I have is Ozotic 518, and it is a cherry red so still has that cool undertone.